Welcome to Must Read, where we single out the best stories from around the automotive universe and beyond. Today we've got reports from Slate, TechnologyReview, and Bloomberg. 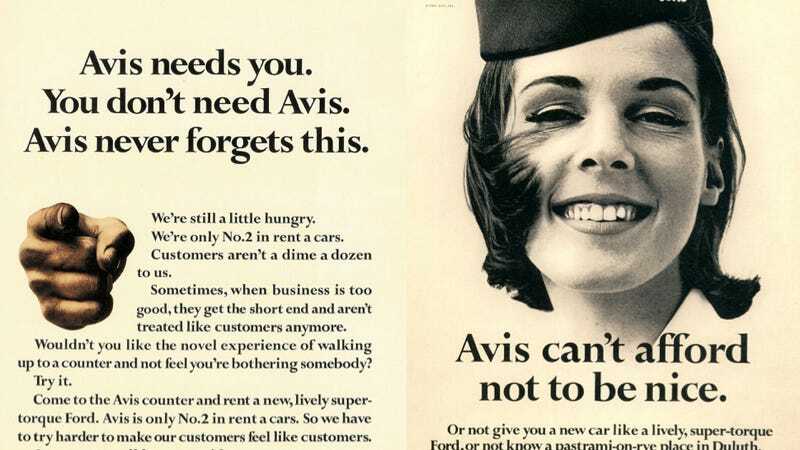 A nice reminder of how Avis took its secondary position in the market and turned it into an advantage. In 1962, Avis was in search of a new advertising campaign. Since its inception, the car rental company had trailed behind the market leader, Hertz. So the ad agency Doyle Dane Bernbach decided to embrace Avis’ second-place status as a sneaky way to tout the brand’s customer service. “When you’re only No. 2, you try harder,” went the new tagline. “Or else.” The “We Try Harder” ads were an instant hit. Within a year, Avis went from losing $3.2 million to earning $1.2 million—the first time it had been profitable in more than a decade. From 1963 to 1966, as Hertz ignored the Avis campaign, the market-share percentage gap between the two brands shrunk from 61–29 to 49–36. Terrified Hertz executives projected that by 1968 Avis might need a new ad campaign—because it would no longer be No. 2. Much as I love the idea of cellulosic ethanol (as opposed to Corn ethanol), it's still a long way from becoming mass reality. Right now cellulosic ethanol can’t compete on its own. It costs more than either corn ethanol or gasoline. Wallace Tyner, a professor of agricultural economics at Purdue University, says cellulosic ethanol will never be cheaper than corn ethanol. However, Poet says it hopes to eventually make cellulosic ethanol competitive with gasoline. Getting to that point, at the very least, will require support from the renewable-fuel standard to help the company build more plants and achieve some economies of scale. Maybe you're better off renting a car from Avis that runs on ethanol. In Shanghai, which has been auctioning license plates since 1986, winning bids hit a record 90,000 yuan this year, enough to buy a new Volkswagen Santana sedan, according to car-pricing website Autohome.com.cn.